Dosyaları forumda verdigim LokumCAM Manager ile uyumludur indirip kurabilirsiniz.. Copyright (C) 2012 - 2016 developed by Javier Sayago (Javilonas). Visit https://www.lonasdigital.com/ for more details. - Recognizes the CCcam reader coming from the Multics and Newbox, indicating at all times the exact version of these by passing the mouse over the version of CCcam since webif. - Fixed several bugs in the webif at when selecting versions of CCcam, now everything works correctly. - Fixed problem cw_api dupliated. - Added provider 002111 (Digi TV) in the emulator. - Debug less aggressive in the background (earlier versions throw a lot of cpu and ram because of this at certain times). - Fix for statistics, new options with more information about the readers and users connected and unconnected. - Fixed the problem that existed in the previous Test whit ajax version, now it works perfectly, allowing enable or disable a reader or user without problems. - Now it will show in the webif the info real for our connections, before when you reiniciabas NCAM always started throwing to all at the same time, they are using your reader or not, now only show the info if indeed any peer or dvbapi is using our line. 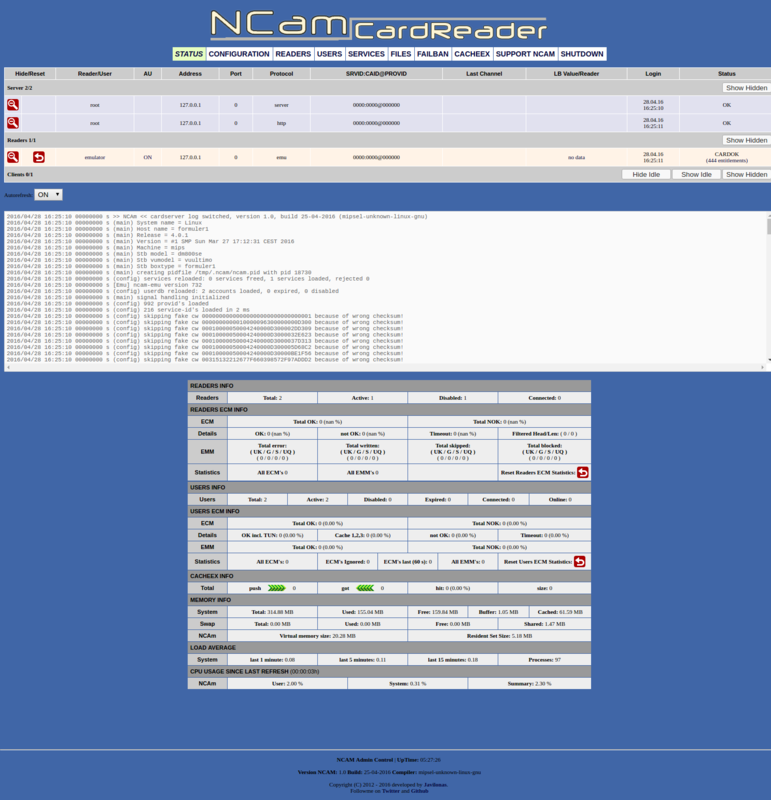 - Compatibility CSP internal between Multics and Ncam or Newbox and NCAM, it's now possible to share locally within the same machine with the CSP internal cache NCAM. - Support Cs357x and Cs378x. - PCSC support and LIBUSB (to be confirmed that works completely, I have not been able to prove). - Surely I forget something else, in the git all changes (for the curious).